This clever ZooBooKoo cube book has 6 ‘pages’ on one side, then turn them inside out to find another 6 ‘pages’. 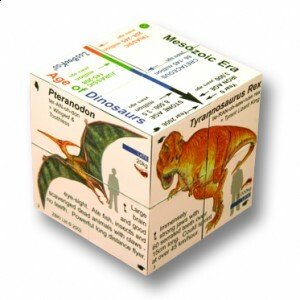 12 dinosaurs, fact-filled ready reference cube, color-coded dinosuar time-line and key. Facts and figures at your finger tips – fun educational gift for compulsive fiddling and learning. Categories: Dino Books & DVDs, Educational Books, Puzzles, Games & Kits.